I used to use a broom on every floor that wasn’t carpet in my home. It just seemed lighter and easier that lugging around a heavy vacuum, especially when it came to the hardwood floors. But as in most cases, time has given to advances in the floor cleaning industry, and vacuums are now incredibly light and much more powerful than ever. Today, we will be discussing what to look for when finding the perfect vacuum for your hardwood floors. Before we begin though, lets go over the benefits of using a vacuum over a broom on hardwood flooring. No stopping to collect dirt and dust in the dust pan. Attachments allow for better corner cleaning. Area Rugs can be cleaned simultaneously, instead of sweep around and under and then vacuuming anyway. Pet dander and hair doesn’t go everywhere when vacuuming, when you sweep it though it becomes airborne. Finally and most importantly, a vacuum can filter out allergens and particles through a HEPA filter, whereas a broom has absolutely zero filtering ability. What to look for when shopping for a vacuum for hardwood floors? Finding the right vacuum for hard surfaces can really be a challenge if you do not set out with a very specific list of specs to look for. One of the most important for me is that it is a very light vacuum cleaner. Especially if you have a staircase that needs cleaning, a light vacuum will save you a lot of back strain when it comes to cleaning your floors. A vacuum without a beater bar is a must. Whether you have the option to remove it, detach it, or it simply doesn’t come with one, a beater bar is what damages your hardwood flooring the most and it could possibly void your floor’s warranty. Cord length is often overlooked as well, which is surprising. Once you start using a vacuum on your hardwood flooring you will soon realize that you move much more quickly than you would on carpet and have to switch outlets more frequently. A longer cord is a big time saver. Now they actually make really cool cordless vacuums that don’t weigh a ton like this Dyson Digital Slim Vacuum. Power is a must for hardwood flooring. If your vacuum doesn’t have the suction required to clean hardwood floors, you will wind up with an airborne catastrophe. 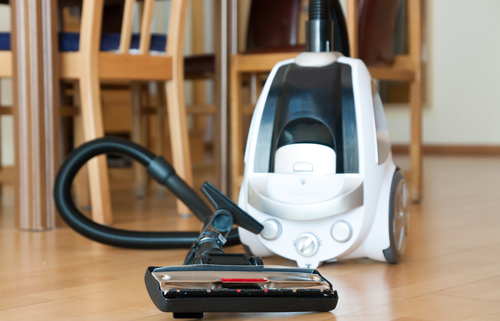 A great filtration system should also be of utmost importance when picking a vacuum. My final thought on finding the right vacuum for hardwood floors is to choose a canister vacuum over an upright one! While this benefits your greatly, the biggest advantages is the maneuverability that comes from the the detached wand. Previous story 5 Fall Dining Room Decoration Finds!